Arrive by train (ticket included) from Vienna to Breclav. On the platform you will meet our representative who will drive you 15 min to your hotel in Valtice. There you will be introduced to the tour and given the bike and all information materials. From Valtice you can take a short cycling loop towards the Czech-Austrian border to see the former “no man‘s land“ of the Iron Curtain and familiarize yourself with the rented bike. Start your biking trip in Valtice, the former Liechtenstein family seat, and cycle through the designed landscape graced with two magnificent chateaux, along with numerous 'follies', romantic structures set in a harmonious way into the surrounding countryside, all enlisted as UNESCO World Heritage. From Lednice head for Pavlov with an archaeological museum streched over the Stone Age mammoth hunters site. Wrap up your day in Mikulov with its imposing castle, the Dietrichstein family tomb and the Jewish cemetery where the oldest tombstones date back to 1605. After morning transfer by car from Mikulov to a viewpoint above Znojmo, the former royal town, enter Podyji National Park with untouched nature, beautiful views of the deep, forested river valley and the last remnant of the former Iron Curtain. Ride down to the smallest Austrian town of Hardegg and back enjoying the easy crossing of the border. 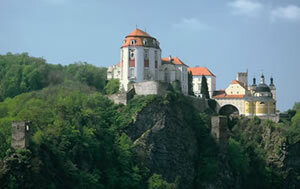 Finish the day descending to Vranov with a Baroque castle perched high on a rock above the Dyje River. From Vranov go up through rolling terrain to visit to a Jewish cemetery in Safov, hidden off the beaten track. Then pass numerous 1930s bunkers on your way to the town of Slavonice, a forgotten Renaissance jewel with sgraffito houses. From Slavonice take a local train (ticket included) to Telc listed as a UNESCO World Heritage Site for its perfectly preserved Renaissance and Baroque town center. Bike in the Bohemian-Moravian Highlands through a mosaic of fields, forests, meadows and ponds nicknamed “Czech Canada“. A unique stop on the way is the memorial to a local Jewish painter Frantisek Moritz Nagl murdered in Auschwitz concentration camp. Finish the day in Jindrichuv Hradec, where you can see the world‘s largest mechanical nativity scene. Take a relaxing ride through the Bohemia Lake District ending up in the medieval town of Trebon, famous for its 14th century brewery, a unique water regulation system interconnecting large fishponds full of carps – the traditional Czech fish, or a family tomb of once mighty Schwarzenberg noble family. Today‘s cycling route starts in the flat Trebon basin, the RAMSAR prorected wetland, and gradually becomes hillier as you approach Cesky Krumlov, the gem of South Bohemia. Before the final climb touch the Vltava River at the Gothic monastery in Zlata Koruna and descend back to the river passing the country’s second largest castle in Cesky Krumlov, a UNESCO World Heritage Site. Enjoy the magic of Cesky Krumlov with virtually intact ensemble of Gothic, Renaissance and Baroque structures including the oldest working Baroque theatre in Europe. Leave the bike in the hotel in Cesky Krumlov and take a comfortable coach (ticket included) to Prague, the Czech capital.